We were at a loss until we talked to Muse. Patricia walked us through the process and then were able to get our claim accepted! Today we serve clients in the states of Mississippi, Tennessee, Missouri, Arkansas, Illinois, Virginia, Kentucky, North Carolina, South Carolina, Georgia, Florida, Alabama, Louisiana, and Texas. Are you or a loved one living with a disability? Have you been rejected in previous attempts to file a claim for disability or supplemental security assistance? 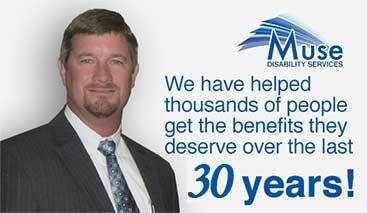 Muse Disability Services is here for you. That’s right, starting with only a single phone call we can help you launch the strongest possible case for your disability needs. Our friendly, experienced and professionally trained representatives are standing by waiting to receive your phone call at 1-800-922-4011. You are an American citizen, and as such you have certain rights including the right to receive assistance in order to provide for yourself. We have seen many cases where good, hard-working people believed they had made a thorough attempt at filing their own claim, and spent months and sometimes years wading through the immense paperwork, lines, and hearings…only to have their painstakingly-filed claim rejected in the end. Our team of qualified professionals can help prevent that outcome for you or your loved one. Whether you are suffering from a physical disability or a mental disability, if you believe that you are unable to perform work functions and earn an income in the traditional sense, then we may be able to help you find the financial assistance you need to find some security in your life. You should not have to worry about where your next meal or bill payment will come from when you are unable to attend to income-producing work that many are able to take for granted. Let our eager, professional staff here at Muse Disability Services show you how efficiently and confidently we can move your individual case through the claims process. No matter what the specifics of your disability claim might be, we at Muse Disability Services can help you identify whether you have a strong case. And we will do the work necessary to get that case handled as efficiently as possible. We will do our due diligence to ensure that your case is handled appropriately and with care at every level of processing by the Social Security Administration. We hope that you will allow us the chance to provide this top-level support and assistance to you or your loved one. Please call us today.